The McKees were passing our second day in the Italian resort city of Sorrento, across the big bay from Naples, with different notions about what to do with our time. We had just returned from a morning visit to the ruins of Pompeii and I was still sort of haunted by the idea of all those lives ended abruptly by something as capricious as a volcano blast. I felt the need to seize the day by doing something extraordinary, so I proposed a driving adventure to the Amalfi Coast, just a few miles away on the other side of our rocky peninsula. I’d heard that this road is narrow and goes on for miles clinging to the side of the cliff. Photos of the this famous coastline showed pastel hued houses and villas piled on top of each other on the steep slopes, all beside a gorgeous shimmering Mediterranean Sea. It sounded pretty cool to me. I told the family what I knew about it and also how my pal Chris had warned me about the narrowness of the road and how busses sometimes need to swing wide on the tight corners. The females opted out, but seventeen year old Wesley was all in. I felt quite confident in my Italian-style driving skills because the day before I had learned to hang in there with the manic drivers of Naples while driving many miles through the center of that big city. An attitude shift had occurred in me that day, and I liked it. For that drive the whole family was in the car, with Melody and I taking turns driving just to share in the fun, while the kids called directions from the backseat using GPS on a smart phone. On those crowded streets, the act of driving completely consumed one’s attention. Cars jostled each other for the available space; motorbikes zipped in and around the cars. If you were flowing along with several vehicles through the twists and turns and had a slight lead for an opening, you were expected to take it and let the followers adjust accordingly. Everybody would simply work it out – rapidly and efficiently. No big deal. Upsetting the order of things by being meek or overly polite didn’t do anybody any favors. We called it “driving like an Italian” and meant it as a compliment because it required skill and constant concentration to stay in the game. Now, with this free afternoon available and a desire to seize the day, Wesley and I looked over a cartoon-like map showing our route. The driving would be interesting, the views fantastic. We would somehow find some swimming somewhere over there and it would probably be interesting swimming. That clinched it. We knew we had to go. The road did not disappoint. The cliffs were indeed steep, the road narrow. And there was a guardrail that instilled confidence. I did all the driving. That was a rule that came with our rental car, an unflashy but sturdy Opel with a manual transmission that allowed the driver to downshift or gear up depending on the power needed at any given moment. Wesley was in charge of finding good songs on the radio and recording interesting video clips along the drive. Having good music quickly became a requirement. Most tunes were current hit songs in English; others were pop songs in Italian. As long as the music fired us up, we let it stay. If it lagged or the Italian DJ took too long between songs, a tap of the “seek” button gave us a new tune. It was remarkable how those songs energized our situation. Perhaps it was our situation that was energizing those songs. Either way, we were having some fantastic moments from our life and there was a cool soundtrack to go with it. And so it went, Wesley staying sharp on the music and me staying sharp on all the turns in the road, happily passing slow moving cars presumably driven by timid tourists, both of us cracking wise about all sorts of things and laughing big. 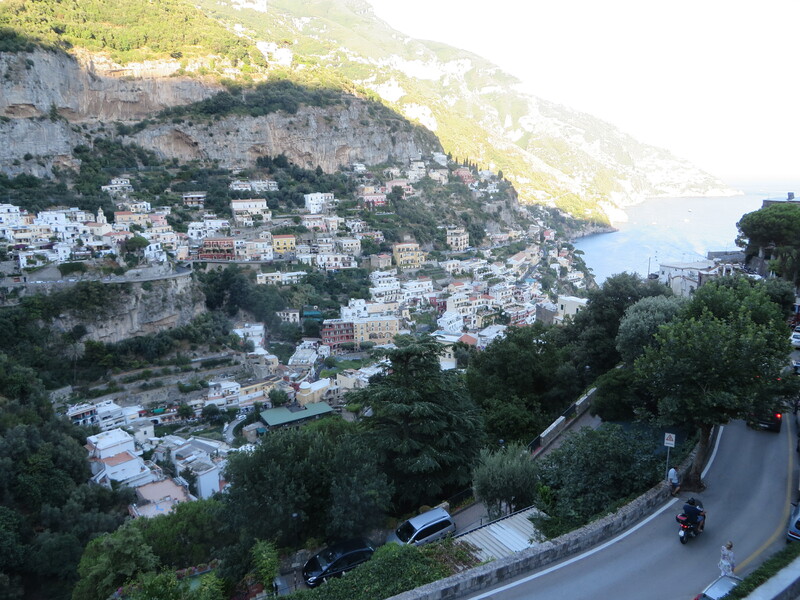 Somewhere beyond the town of Positano, we found a parking space right next to a narrow stair headed down the cliff. Out of the car, everything seemed still and restful, especially all that blue water hundreds of feet below. We followed the stair downward as it wound between houses and walled gardens. Finally nearing the bottom, we could see we were headed into a narrow cove with very steep rocky sides. Around the last turn of the stair we saw a wide concrete ledge that had been added at one side of the cove just a few feet above the water. Eight or ten people were there. Most laid out to catch some sun. A few boys swam about. It felt sufficiently public for us to join in. Along the steep rock of the cove, there were no waves; just the slow rhythmic swell up and down of the ocean surface. We could make out big rock faces under the surface that disappeared into deep blue. Wesley found a ledge part way back up the stairs for his big leap in. I decided to dive in because I’m not very good at it, and the challenge makes it feel like even more adventure. One instant of plunging down headfirst with arms in front, and then the beautiful shock of the cool water, so salty and energizing. We repeated this a couple times and then Wesley found a way to get out of the water that was much more fun than using the built-in rusty ladder. Treading water alongside a rocky ledge, we would kick and thrust ourselves upwards right as the ocean swell lifted us to where we could hoist ourselves partway onto the edge of the big flat rock. There we would brace ourselves in a precarious balance, barely hanging on as all that water then retreated backwards off that rock and worked mightily to pull us back into the sea. After five or six seconds of enduring this powerful waterfall, the water was gone and we could easily heft ourselves fully onto the big flat rock to stand up, enjoy the warm breeze and then head up for another dive in to repeat the fun. In this way we passed a half hour. Then back up all those stairs to the car for another supercharged drive, this time back to Sorrento where we would join Melody and Gwenna for dinner. The day sufficiently seized.